At first, it was in a text only version inspired of Don Rosa's tree, Barks' sources, cartoon sources and also other famous characters, then it became illustrated and more and more enlarged. It's been built thanks to the help of the trees below, but also thanks to the help of dozens of people throughout the world in my researches, among them fellows from the DCML, and also thanks to the INDUCKS database, a very useful tool. 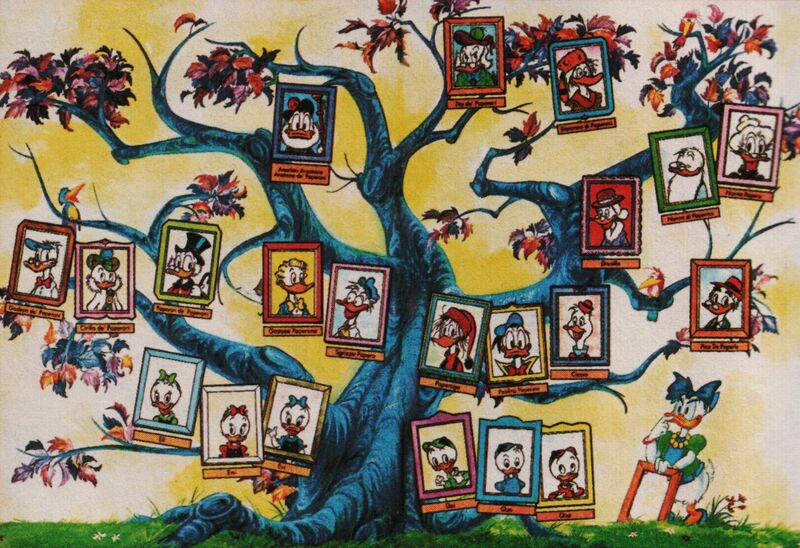 Netherlands chose to publish another version of Don Rosa's tree, totally redrawn by the artist Michel Nadorp, probably becasue either Nadorp or the publisher decided to "hide" Donald's parents and Grandpa Duck just as Don Rosa did with Huey, Dewey and Louie's father, thinking it was better to keep them as mysterious characters. It has been first published in 1995 in "Donald Duck" #1995-23, by the title "Stamboomposter".